First of all, this page is not trying to list anywhere close to all of the repeaters that can be reached from the San Fernando Valley. The Los Angeles area has lots of wide-coverage repeaters on mountains all over the place (some of them over 6000' up). You can get into machines dozens of miles away even on a low-power handheld. San Fernando Valley as seen from space. The northeastern area is lighter because the streets and buildings were lined up with the radar source, making them more reflective. There are a lot more repeaters available. My inclusion or non-inclusion of any in the following listing does not and should not infer anything about them. I am only listing some of the ones I think stand out in some way from the regular crowd. During the summer of 1999, the frequency spacing on the 440 MHz band was changed from 25 KHz to 20 KHz, increasing the available repeater pairs by 25%. Even now, some machines are still not changed over, so it may be a little while more before everyone's moved. Most of the repeaters were simply moved down by 5 or 10 KHz into the new assigned frequencies; some moved up 5 KHz into theirs. I will be updating the listed 440 MHz frequencies here as I can verify them. For more information on the changes, please visit the Southern California Repeater and Remote Base Association (SCRRBA) page. Times are local. Details of these repeaters are below. You can see that many of the nets are on Monday night. K6CPT 224.30 - 100.0 Mt Disappointment " "
K6IYK 224.36 - 107.2 Loop Canyon V.E.R.A. K6VE 224.48 - 110.9 Contractors Pt Mountain Repeater Assoc. KJ6TQ 447.82 - 67.0 Mt Lukins M.A.R.S. The ARRL Repeater Directory. This covers all of North America and a wide portion of the rest of the Western Hemisphere. The new edition comes out around April each year. Doubtful whether it really gets updated much, as they only accept lists from area coordinators. There have been complaints on newsgroups that it's got some glaring errors and omissions that have gone for years without getting fixed. It's got some real problems with varying formats from one area to another. For instance: their listing of 440 MHz repeaters in Southern California is next to worthless; if I don't belong to one of those closed or private systems, then I couldn't care less that they "cover the area." They have lots of duplicates in that section. It should be a lesson to anyone else on how NOT to make a repeater listing. Now, how would I improve that book? Make it simple and better organized. It's getting too thick. Make one version for North America, and a separate version for everywhere else. If I should plan to go to South America or Australia, I'll be sure to buy a copy. I sure don't need to know about them now. Have ten listing coordinators, one for each call area, who would report to whoever the main editor is (if any). These would be for the geographic area, not based on the repeater trustee's callsign. They should accept updates from any qualified person representing a repeater owner or club. In the listings, divide each state into sections based on the county where the repeater is located. (No more "Covers Area" junk.) Look at how they've currently screwed up (in different ways) Southern California, Arizona, and Texas. All that would be standardized and I think far easier to use. Do away with listing nonexistent machines (paper repeaters). Has lots of ads but they aren't too obtrusive. Still, it's a nice compact size for the glovebox, and good to have along on trips. U.S. Repeater Mapbook by Bill Smith N6MQS, published by Artsci. Has very good maps and lists open repeaters. There are ads all through it, but it doesn't hinder it much. A must for vacation trips. They also have an online repeater list. The Southern California Repeater Location Guide by Kevin Karamanos WD6DIH and Karl Pagel N6BVU. This is packed with useful information, including maps, and includes some neighboring states too. One great feature is that the listings are by frequency, making it easier to find out which repeater you stumbled across while tuning around. However, it's rather vague on some entries, simply saying "SO.CAL." instead of giving a location; and what's the point of listing anonymous callsigns such as "W6***"? S.C.A.N. Southern California - Arizona/Nevada Repeater Guide, Special Southern California Edition, by Rick DiFiore WA6KFI. This one is about the size of the WD6DIH/N6BVU guide and also contains a lot of useful information. One thing I can say for this one is that it gives more specific location information than the other one. However it doesn't have any maps. W6VIO (JPL). This one's really cool, color-coded by county and with lots of details. ArtSci's Online Repeater List. Unfortunately, all of California is lumped together, so it's hard to sort out the regions you want to look for. Looking for repeaters in other areas? Try AC6V's List of Other Repeater Listings. Some repeater owners are wary about giving details regarding the location of their equipment. Often it's inside a shared facility and a number of strangers can gain access. Other times it's a relatively unguarded site, all too easy to break into if you have the time. So, sometimes repeater owners will lie about the real location, or just give a vague reference; after all, most users only want to know where it is so they'll have some idea of where it can cover. For other detailed site info, there is a book available, titled "Radio Sites of Central and Southern California" by Adams and Parkyn. It includes maps and site information. Sometimes the origin of a repeater is shrouded in the mists of time, and newer users get incorrect information about a machine. Take, for instance, the KB6C repeater on 147.735 MHz. It's always been known as the Magic Mountain machine, but not because it's anywhere close to Six Flags Magic Mountain (it's not). Years ago it was on another peak east of Little Tujunga Canyon. The peak was called Magic Mountain, and it had nothing to do with that amusement park of the same name that opened in Valencia in 1971. A few years ago the repeater was moved to its present site on Oat Mountain, but everyone still calls it the "Magic Mountain" machine and I've sometimes heard some misinformed users telling newer users that it's because it's located close to the amusement park. Despite my telling you the real story, the incorrect story will probably still circulate. Oh well, that's someone else's problem, if any. Oat Mountain - north of Chatsworth, elev. 3800'. The top is covered with microwave and commercial radio sites, and several amateur repeaters. Covers San Fernando Valley, Santa Clarita Valley, and can reach west into parts of Ventura County. Can also be heard well to the south into Los Angeles and portions of Orange County, and northeast into the Palmdale area. Loop Canyon - north of Sylmar, elev. 4000'. Pretty much limited to San Fernando Valley and Santa Clarita Valley. Can be worked from other areas but there are a lot of dead spots, such as the Newhall Pass (I-5 and Hwy-14). Contractors Point - north of Sylmar. East of Loop Canyon and pretty much the same coverage. Mt Lukins - east of Tujunga. Good coverage of the San Fernando Valley and parts of Los Angeles. Mt Wilson - north of Altadena. This is where most of the commercial TV transmitters are located. 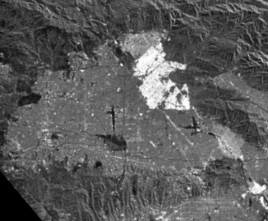 Coverage of most of the metropolitan area of Los Angeles, Orange, Riverside and San Bernardino Counties. Mt Disappointment - northwest of Mt Wilson at a slightly higher elevation (6000'), with similar coverage. Whittier Hills - located in Whittier area. Good coverage to Los Angeles and Orange Counties and some surrounding areas. Johnstone Peak - north of San Dimas/Glendora. Good coverage into Los Angeles and San Bernardino Counties and some surrounding areas. Hollywood Hills - north of Hollywood (how'd you guess?). Good coverage to Los Angeles and Orange Counties and some surrounding areas. Santiago Peak - east of Santa Ana. Good coverage to Orange County, portions of San Bernardino, Riverside, Los Angeles, and San Diego Counties. The Condor Connection is a system of linked repeaters all over California, and includes some in Nevada and Arizona. It's an open system, and with it you can talk to hams hundreds of miles away, all on VHF. The Condor system is on the 220 MHz band and is mostly available all the time. Mountain Repeater Association (MRA) operates open linked repeaters on Contractor's Point, with linked repeaters covering the California high-desert cities, Las Vegas, and Pasadena areas. This one is also on the 220 MHz band. The WALA Linked Repeater System is another one covering much of California. In San Diego and Imperial Counties (and in western Arizona), try out the Calzona Link which is sponsored by the East County Repeater Association and the Arizona Repeater Association. There are several other open linked systems, but some of them are part-time, and others might only link 2 or 3 other repeaters over less area. When you use one of these systems, give yourself extra time. Wait before transmitting, and wait after you key up before beginning to speak. Some of the link may take a full second to get transmitting, and people might miss parts of your conversation. Remember also, these links are done by the good graces of the repeater owners, and they depend in no small way on your support. Don't abuse them, and don't take them for granted. The ZIA Connection used to be an open system on 2 meters, covering Arizona and New Mexico and parts of other states. It was disbanded in 1999. Portions of the old system may still be operational, but that's up to the individual owners now. You can still go to the site and read why Milt chose to shut it off. Sobering reading, because it could happen to your favorite local repeater unless you help out and support it. Some facts of life about repeaters in Los Angeles. The 2 meter band can be a garbage pit with many jammers, lids, and other clueless people; very depressing to listen to at times. It's THE most popular VHF band, though, so that's why everyone uses it. The 220 band has a decent number of open machines and a lot less garbage than 2 meters. You just won't find as wide a variety of gear to work it compared to 2M or 440. This is a popular band with some emergency service organizations because most scanners don't cover these frequencies, so communications will be a little more secure from snoopy news organizations who listen in to ham repeaters during "the real thing" for up-to-date information. CTCSS (or PL™ tone, ™ of Motorola) is required now on most repeaters, mainly to reduce interference. That's not a big problem with most newer radios, but many older ones don't have subaudible tones. Most repeaters have a 2 minute or less timer. Some are set for 90 seconds, and there's even some set for 30 seconds! Obviously, they're not for normal ragchewing: just make your call, then QSY somewhere else once you've made contact. Repeater use priorities go pretty much as follows: Emergency traffic, nets, autopatches, mobiles & portables, and finally base stations. LISTEN for a while before transmitting. "It is better to remain silent and be thought a fool, than to speak and remove all doubt." Southern California VHF and UHF repeater pairs are extremely packed. There simply aren't any open pairs left, and it's been that way for a couple of decades now. In 1999, SCRRBA realigned the 440 MHz band to create more available pairs, but that will be only a temporary reprieve. A closed system is a membership group that will usually accept new members. A private system is one that only accepts those people they want ("don't call us, we'll call you"). This is a big difference, but some repeater directories don't make this distinction. If you manage somehow to get onto one of those private repeaters, the least they may do is simply refuse to talk to you. More often than not, they will inform you that you are on a private machine, and will either ask you to leave, or tell you to leave. Various groups such as Cactus require that a prospective member be sponsored by an existing member; and then there are the dues of $120 a year or more. But you can tune across the 440 band any night of the week and hear some fantastic state-to-state links going on. This is what they pay for. Why are the private groups this way? Good question. Sometimes it's just to screen out "appliance user" weenies and maintain a smaller but more highly technical membership. Sometimes it's for legalities involving the use of remote bases, because users of these systems are defined as "control operators" in their own right and the system trustees need to make sure that everyone knows how to operate the system properly. Here's a document from WA7HXO in Southern Nevada, which explains their view on it pretty well. Or, it may be simply because they want to limit the use of the machine to a select group, which is their right under FCC Part 97.205 (e). The simple fact is, the more extensive, the more expensive. It costs a lot of money on an ongoing basis to maintain systems as big as some of these. Therefore, these big systems need people who will be in for the long haul in terms of monetary support. They also don't want people whining about the other people they hear on the machine, so a prospective user is encouraged to do a lot of listening to the system before applying for membership. If you don't like who or what you hear, don't waste time by joining. They also don't want to have to constantly change all of the secret access and control codes; a low membership turnover helps take care of that. One local system (MARS) went closed awhile back. It was done for protection against legal actions, which have nearly buried some other repeaters; KPRA comes to mind as one high-profile case. The MARS guys only need you to sign a statement that you'll obey the rules and not cause them trouble, and you can use their repeaters. It used to be that hams didn't sue each other; times have changed, it would seem. There are many closed systems that actively seek new members; they'll just about accept anyone who's willing to pay the dues. Some of them are pretty good systems too, with remote bases, IRLP, or other cool things available. Some of the popular nearby membership groups include: SuperSystem, Cal-Net, WinSystem. And then you have the private systems. You can't join unless they decide you can. Usually this means you must be invited to join by an existing member who becomes your sponsor, as well as trainer. His reputation with the group is on the line if you turn out to be a flake, creep, or deadbeat who won't support the system. While I do not agree with what all of the private systems do, I understand their reasons. The same thing has been happening to computer clubs. I was a co-founding member of one in 1984. By 1994, it had been turned into the very same kind of computer club we'd originally formed our club in order to avoid. People would come to have someone fix their computer for them, not to learn how to fix their own computer problems. We even had outright software piracy going on right at the meetings. A nucleus of about ten people did 99% of the work in running the club (yes, I was one of the workers, serving as a board member, various club offices, SIG director, and class instructor). The rest were all freeloaders. So in 1994 a bunch of us guys walked out of that other club and never looked back. (Or at least I didn't look back.) We formed our own computer club, with no politics, no dues, and no sales-pitch speakers. We did a lot of hands-on stuff, people helping people to learn more. Membership was strictly by invitation only, and subject to the approval of the other members. It's still going, though many of us have moved in the years since and/or gone separate ways. Take a look at these two links for some private repeater systems and what they have to say to anyone thinking of applying for membership:  . Sound familiar? "Don't call us, we'll call you." What does this all mean to an out of town visitor? Unless you already belong to one of the closed or private systems, they are of no use to you. The open machines are the only ones you can use when traveling. It's a good idea to help support those repeaters that you regularly use. The cost of running a repeater includes: buying, repairing or replacing equipment, mountaintop site leases, Forest Service permit fees, insurance, the electric bill (the real killer on some popular machines), the phone bill for the autopatch, and on and on. There is a weekly simplex net held in the San Fernando, Simi, Santa Clarita, and Antelope Valleys, but not necessarily limited to just those areas. (In fact they get checkins from all over Southern California!) It's Tuesday night at 8:00 pm, and the frequencies are 144.830, 146.565, 146.58, and 445.025 MHz, depending on the area. Please use a PL of 88.5 Hz, some of their crossbanding is using PL to reduce interference. The purpose is to establish and practice techniques for local emergency communications without repeaters, such as after a major earthquake. The net is organized by Debbie KF6BZP and Tony KF6BZQ. CERT (Community Emergency Response Team) is a program sponsored by the Los Angeles City Fire Department. They are looking for civilian volunteers, and especially for ham operators. They would like to establish a communications network to be used in the event of a disaster (earthquake, fire, windstorm, etc). In the event of a disaster it has been proposed that local hams use 146.58 MHz simplex as a check-in frequency. You would be assigned to another frequency or repeater after they have you checked in. Howard Burkhart KB6MYE, 310-832-5836 voice, 310-521-0162 fax, or send him email. Captain Jim Gaffney, Commander, Disaster Preparedness Unit, 818-756-9674. Mailing address is: 5021 N. Sepulveda Blvd, Sherman Oaks, CA 91403. Fax number is 818-756-9681. Southern California Monitoring Association holds a weekly net Wednesdays at 7:30 pm, on 449.625 MHz. The PL is 110 Hz. They have great information for scanner and shortwave listening. They hold monthly meetings in the Westchester area near LAX. Here is a link to San Fernando Valley Scanner Frequencies. Good compilation of listings for police, fire, and other agencies. I have some information on local area ham radio classes and exams. Here's information on the local Computer Shows. You can always use more computer equipment! San Fernando Valley Amateur Radio Club. Meetings, classes, exam sessions, nets. Santa Clarita Amateur Radio Club. Information on their nets and activities in the area. Antelope Valley Amateur Radio Club. A very good page of information on ham activities in the Antelope Valley area (Palmdale, Lancaster, Littlerock, Rosamond, Mojave, etc.). Local T-hunting, simplex net, and other stuff. Sulphur Mountain Repeater Association. They have information on a number of repeaters in Ventura County. This page includes a nice map of the area and you can find out about each repeater site and the machines available. Baldwin Hills Amateur Radio Club, or BARC, has several machines around Southern California. Traveling out of the Los Angeles area? Then you'll want to check out my list of suggested repeaters. I welcome all comments, I even reply to many of them! Updates are especially welcome, since my free evening time for listening is rather limited these days.